The KAMUT® trademark was created to protect and preserve the exceptional qualities of this ancient grain for the benefit of all those who are interested in high quality, healthy food. Today, the KAMUT® trademark is a guarantee of receiving the unhybridized, unmodified, and non-GMO ancient khorasan wheat, always organically grown, that meets high purity, nutrition, and quality standards. 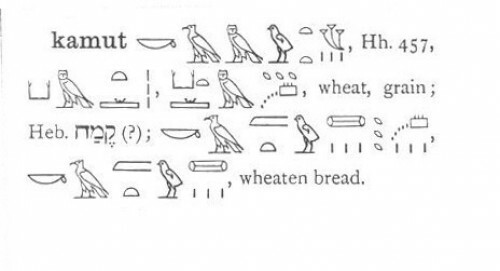 “KAMUT”, meaning wheat in the ancient Egyptian language, was found in An Egyptian Hieroglyphic Dictionary by E. A. Wallis Budge, first published in London by John Murray in 1920. Since this was from a dead language and KAMUT was not a word in common use in other languages, it was possible to register it as a trademark. It is possible, however, that one could take khorasan wheat and manipulate it in an attempt to improve some of its agronomic shortcomings, which would be completely legal. Our philosophy has been to preserve the variety without these kinds of manipulations. Thus, when consumers see the KAMUT® trademark, they can be sure that the products contain the pure ancient khorasan wheat. Any wheat sold under the KAMUT® trademark must follow the quality specifications of the KAMUT® brand program. Consequently, anyone who wants to use the KAMUT® trademark must sign, free of charge, a license agreeing to follow these specifications. In this manner, consumers are guaranteed authenticity, purity and quality when they see the KAMUT® trademark. 3. Have a protein range of 12% - 18%. We protect the meaningfulness of the KAMUT® trademark by ensuring its proper usage and the authenticity of products bearing it for the benefit of all consumers and companies that use and depend on it.